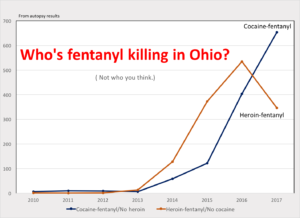 How much cocaine in Cuyahoga County has fentanyl in it? 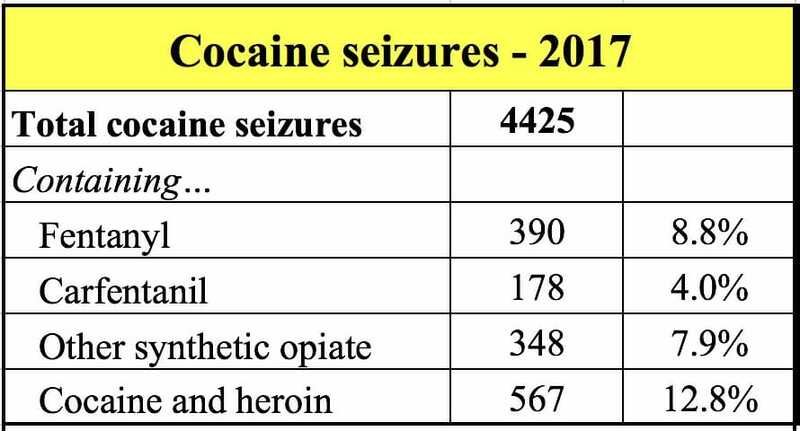 Heroin results for 2017, too. At least 9% of cocaine tested at the regional crime lab in Cleveland last year was adulterated with fentanyl, carfentanil or another fentanyl variant, according to statistics provided to Harm Reduction Ohio by the crime lab. Carfentanil, the most potent and deadly fentanyl variant, was found in 4% of cocaine in 2017, the lab reported. Carfentanil has killed hundreds of Ohioans, especially cocaine and meth users, since it entered Ohio’s illegal drug supply in 2016. The Cuyahoga County Regional Forensic Science Laboratory’s test results on more than 4,000 cocaine samples are the first publicly available data showing how much of Ohio’s cocaine supply is contaminated with fentanyl. 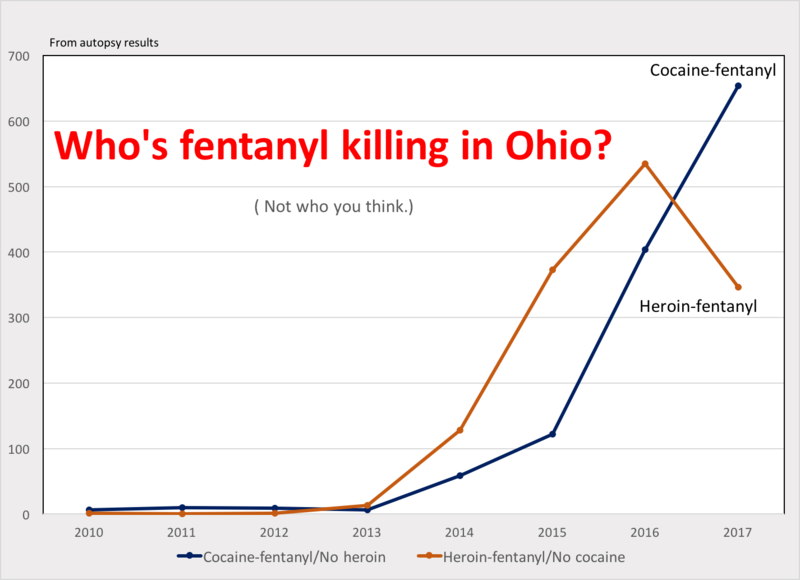 The crime lab’s data helps answer a critical question: is a little adulterated cocaine killing a lot of Ohioans or is nearly all of Ohio’s cocaine supply contaminated? Cocaine-fentanyl mixes were found in the bodies of 850 drug overdose victims in Ohio in 2017, the state Department of Health reported last week. Another 283 overdose victims had methamphetamine-fentanyl mixes in their systems. Ohio’s focus on opioid addiction and overprescribing of pain killers by doctors has failed to recognize that the drug overdose epidemic has changed. Paul D. Boggs, Drug Chemistry Supervisor at Cuyahoga County Regional Forensic Science Laboratory in Cleveland, reported his crime lab tested 4,425 samples of cocaine that had been seized by law enforcement and 2,178 samples of heroin. He did not provide counts on drug seizures in which the only drug found was fentanyl or an analog. In many drug seizures today — especially for heroin and to a lesser extent for cocaine and meth — none of the traditional or desired drug is found. Carfentanil was found in 19.7% of heroin that was tested. 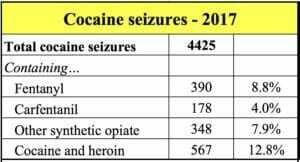 Fentanyl was found in nearly half. And other fentanyl analogs — such as furanylfentanyl and acetyl fentanyl — were found in more than a third. The numbers overlap, so a total of contaminated heroin and cocaine could not be calculated. For example, a drug could have both carfentanil and fentanyl in it. Meth numbers were not requested by Harm Reduction Ohio or supplied by the lab. Cocaine and meth are stimulants, which have the opposite effect of opioids. Consumers rarely want the drugs mixed together, except sometimes as a niche product called a speedball. Cocaine and meth users are especially vulnerable to overdose death because they lack opioid tolerance. A heavy heroin user could survive a fentanyl dose two to four times greater than one that would kill a cocaine or meth user. “Heroin users expect fentanyl to be in their drug and adjust their dose accordingly. Cocaine and meth users don’t expect opioid in their stimulant because it doesn’t make any sense. 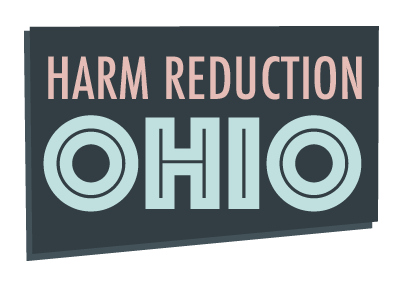 Why mix a stimulant with a drug that makes you nod off?” said Harm Reduction Ohio President Dennis Cauchon.